I can never decide whether I enjoy going for yum cha or weekend brunches more. Lately it's been veering towards the latter as I've finally discovered the best bagel in hong kong at Oolaa (one of my favourite restaurants for good food at decent prices). 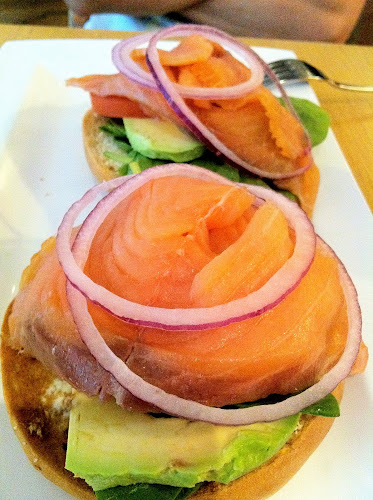 The bagel is a perfect consistency, smothered with cream cheese and filled with a very generous helping of smoked salmon and red onions. I loved the capers in the little spoon too, along with the side salad. Absolutely delicious and a pretty good size considering the price was cheaper than the Press Room's bagel which seems to get smaller each time I visit... I believe Press Room bagels cost $90+. Oolaa eggs bene is very substantial and deliciously moreish. The hollaindaise sauce used here has a hint of citrus which gives it a nice tang. The picture above was leg ham and buttered baby spinach, but you can get smoked salmon / spinach, or bacon / avocado. Definitely want to come back to try their salmon rosti and french toast! Oolaa's salads are also delicious - my go to meal when I want a healthier dinner. I liked that the bagel came with avocado which is another of my current obsessions but the bagel itself was not good :( Tasted almost like a sandwich, completely lacking the chewy density of typical New York bagels. They were also very stingy on the cream cheese (though they will give you more when asked). Pretty mediocre. This was pretty yummy with nice succulent chicken pieces but I thought the bread was overly toasted - it was quite hard to chew and hurt the roof of my mouth. I did enjoy the chili jam that came in the pot though, and the wedge fries were delicious! Definitely a better pick than the bagel. I don't usually want sweet food the first thing in the morning but we saw this come out and had to order it! Decent crepes served with vanilla ice cream (which I wished we had more of) and doused in chocolate sauce and hazlenut bits. Can't really go wrong with a combination like that! 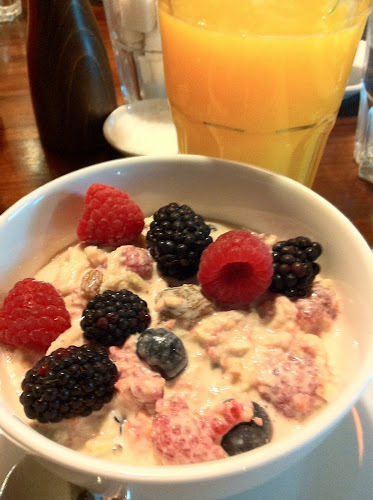 And I can't put up a brunch post without my ultimate favourite brunch item - bircher muesli. I know you can make it quite easily at home but noting the name of my blog, I'm just far too lazy. Bircher muesli is soo much better than your typical breakfast cereal and is packed with good nutrients. I love feeling healthy first thing in the morning!